LigerBots Blog - Full Steam Ahead in Week 4! Full Steam Ahead in Week 4! The LigerBots just finished week four of build season, and our project planning board is full of sticky notes, each one for an individual task in the works. At the end of every team meeting we gather in the shop to report on what we have accomplished that day and proudly spear the note for each finished task on a spike at the back of the task board. Team leaders gather in the shop at the end of a meeting to report on their progress. 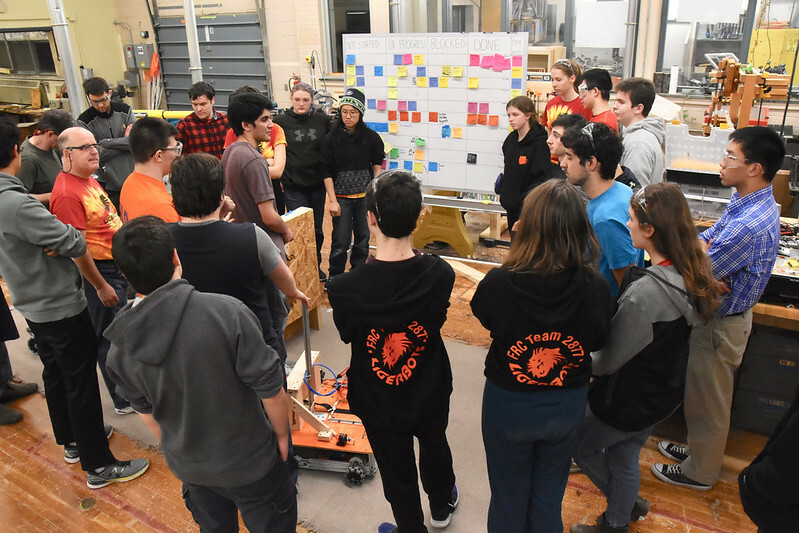 We meet six days a week during build season, and we need every hour of meeting time to finish our robot and our competition-season marketing. Thanks to increased sponsorship of our team during the past few years we have been able to make two identical robots each year. This allows us to continue work on our design, using our second robot for testing, even after the six week build season is over and we must put our competition robot into storage until our first tournament. Keiji files a piece of 80/20 metal bar for a chassis cross-piece. Gil cuts a piece of polycarbonate to make new robot arms. This year we are making two chassis and two game-piece elevators, but only one set of arms to place the game pieces into the goals, and one intake for the “cargo” ball. The intake will roll the ball in from the floor into the center of the robot. Arms on an elevator will pick up the ball from inside the robot once it is rolled in, or get a “hatch” disk from the loading station. The arm will place the ball or hatch panel into the field element goals. 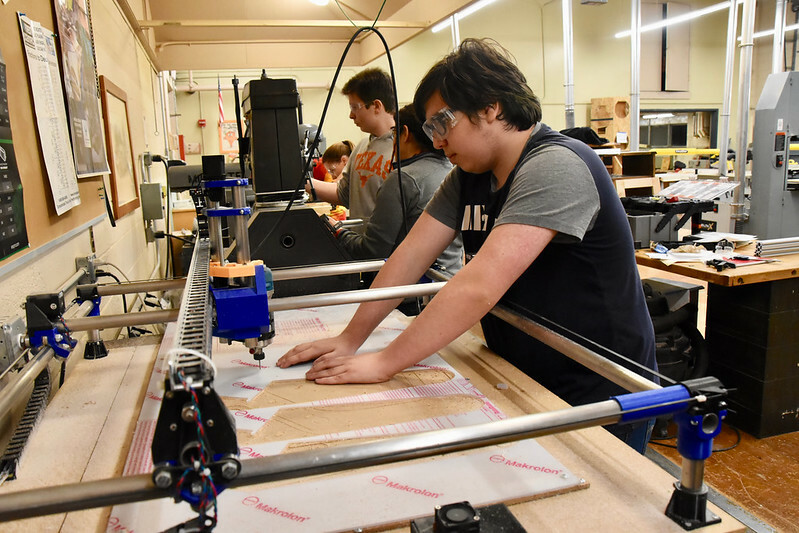 Since we are allowed to keep working on 30 lbs of our robot after the end of the official build season, we will be able to continue iterating designs for the arms and intake until we are satisfied with their performance. 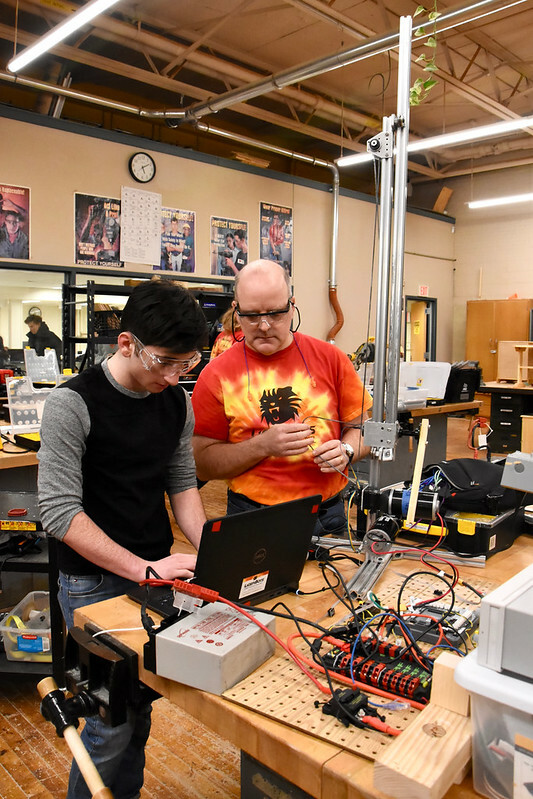 Mark works with Coach Fitz to create software that will control the robot’s game piece elevator. 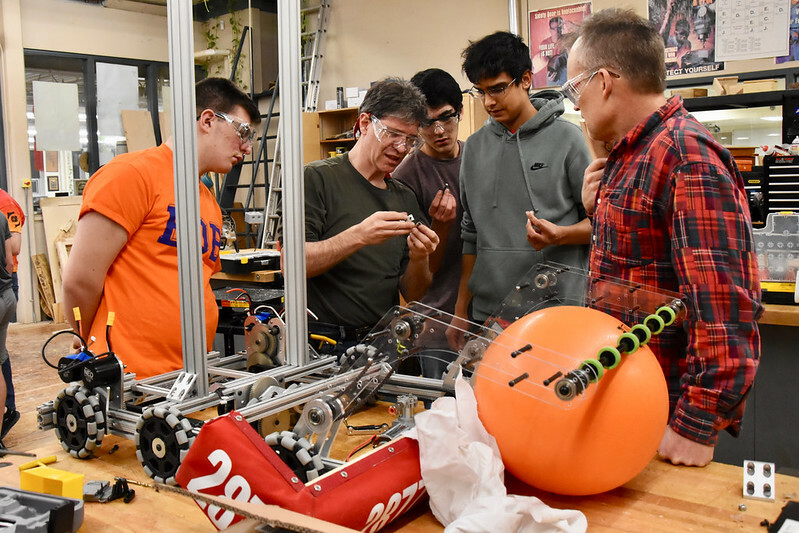 Ethan, coach Igor, Ali, Vivek and mentor Mark work on the “cargo” ball intake mechanism. 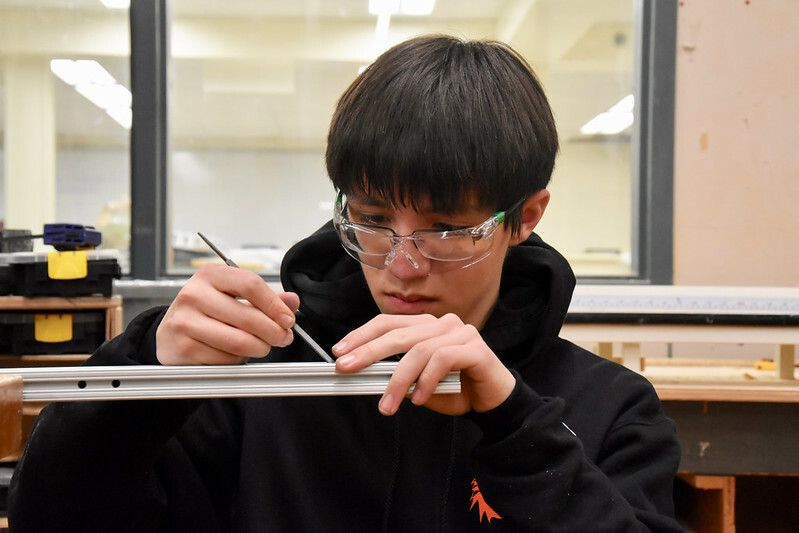 Putting our robot’s electronics on a lightweight, perforated polycarbonate board that has lots of holes for zip ties has given us flexibility in where we place our components. 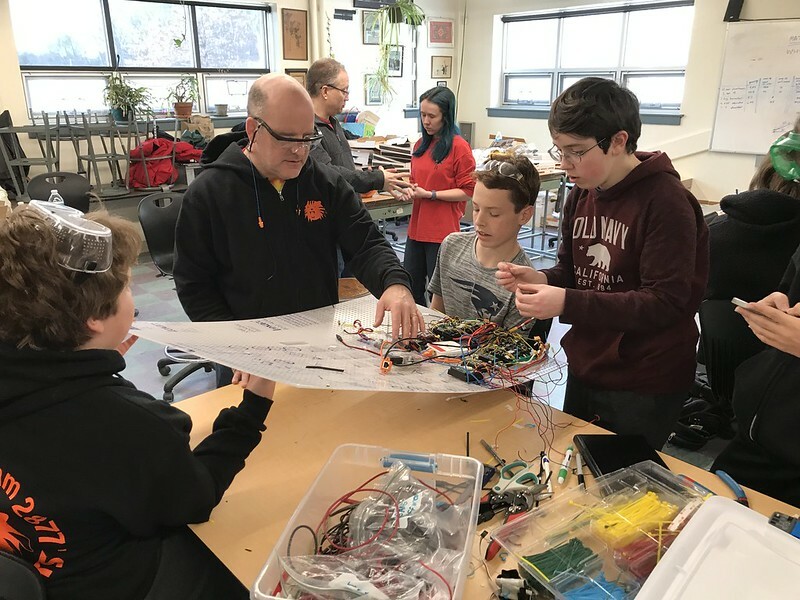 Coach Fitz talks to Yonik, Mark and Daniel about adding wiring to the perforated electrical board. 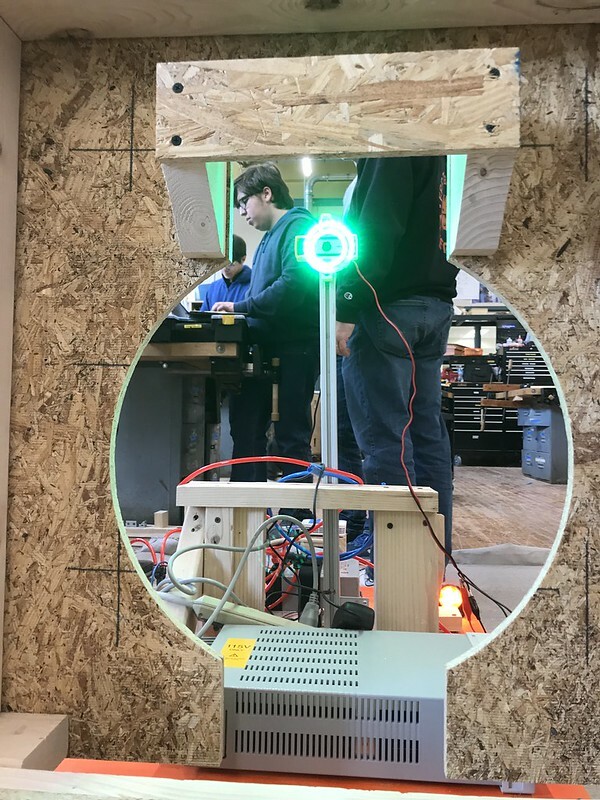 We are creating a robot vision system consisting of cameras and software that will allow the robot to “see” the reflective tape on the field elements and align the robot to the goals. Gil programs the “roadkill” test robot to improve the robot’s ability to “see” the reflective tape on the mockup goal. This week we finalized our sponsorship list for competition season and started adding sponsor logos and names to all of our competition and outreach materials. The support of our valued sponsors and donors means that we will have the funds to continue building robots and promoting STEM in Newton. But, fundraising at the LigerBots never stops, so we will continue to reach out to companies in our community for support. We have finished our Chairman’s award submission essay and are working on the list of questions we must answer for the submission. Team members sang and recorded the song they wrote for our Chairman’s award video. Now we can turn our attention to preparing the oral presentation that we will give to FIRST judges during our competitions. 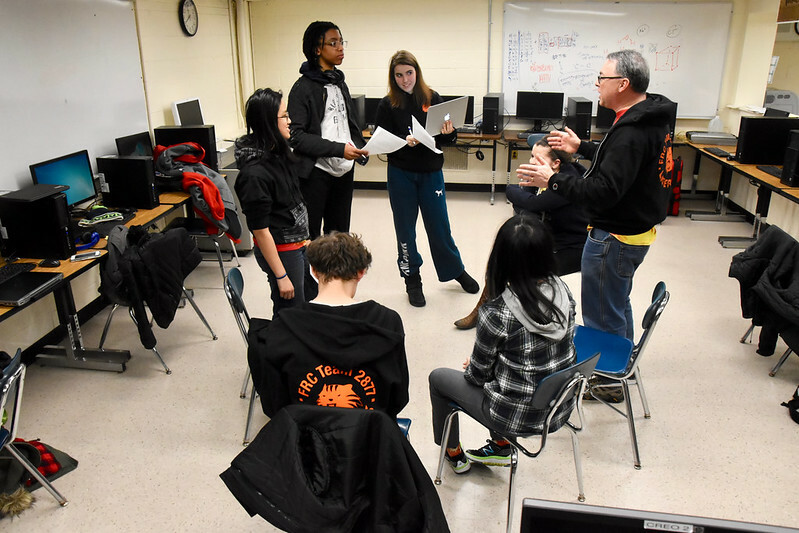 Andrew, AJ, Jadon, Carolyn, and Amanda work on the 2019 Chairman’s award presentation with mentor Chuck. We are in the midst of creating the team booklet that includes the essay and lots of other information about the LigerBots. Fall training in graphics, writing, and public speaking has ensured that our students are able to work quickly on the various aspects of the Chairman’s award submission now that it’s crunch time. 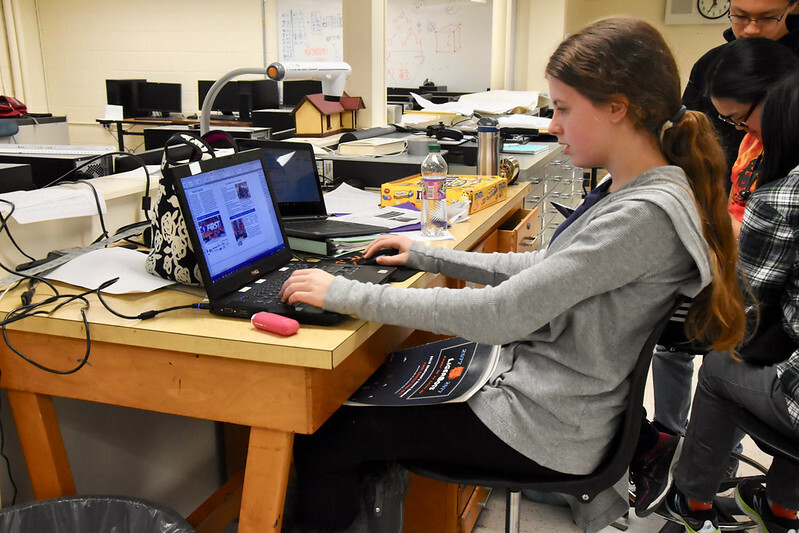 Clara works on the Chairman’s award submission booklet, using Adobe InDesign. After a recent team dinner we all gathered for a team photo in the Newton South High School cafeteria.